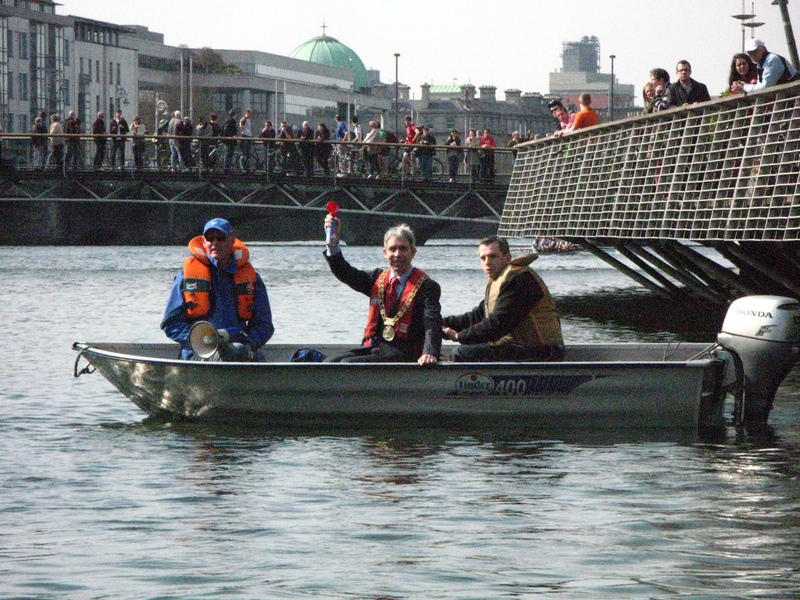 Lord Mayor Andrew Montague starting the 68th Dublin Head of the River Race, on Saturday 24th March, accompained by Pat McBride and John Walsh. This year’s Dublin Head was a great success. As well as crews from all our neighouring clubs in Islandbridge, we were delighted to welcome crews coming from Belfast Boat Cub, Shannon Rowing Club, Queens University, St. Michael’s Rowing Club & University of Limerick. Great also to see Blackrock College entering two junior crews, one of which took a ‘little dip’ down at the island to cool down after the race. As is customary, the race was started by the Lord Mayor Andrew Montague, with the assistance of Bill Powderly and his team from the Civil Defence. Men’s Senior VIIIs was won by UCDBC, closely followed by St. Michael’s Rowing Club, and then by a Neptune / Carlow RC composite. Women’s Senior VIIIs was won by a St. Michaels / University of Limerick composite, with wins at various other categories for DUBC (winning Men’s Intermediate VIII and Men’s Novice VIII), Commercial Rowing Club (Men’s Junior 8 and Men’s Senior IV), DULBC (Women’s Intermediate VIII) and Shannon Rowing Club (Women’s Novice VIII). To download a PDF of result & times, click here for results by category, and here for results sorted by time. Thank you! : Old Collegians would like to thank all the clubs who attended, and everyone who volunteered their time and energy to make make event such a success. Thank you also to the Lord Mayor, and to Bill Powderly and his team from the Civil Defence. We hope to see you all again next year! This entry was posted in Dublin Head by jameskelly. Bookmark the permalink. Enjoyed that lazy photographic return to the Weir after 60 years !